Cookies were the first genre of food that I felt like I had mastered. I started making them regularly when I was about ten and I pretty much never stopped. Cookies are a kind of traditional comfort food: even for those of us not lucky enough to be descended from a long line of bakers, they evoke childhood, nostalgia, and affection. For me, though, it’s the process of making cookies that is comforting: creaming the butter, cracking the eggs, the difficulty in stirring at the end, the rhythm of dolloping dough onto the cookie sheet and then lifting it off 10 minutes later. There’s something about the way it involves my body and all of my senses that makes me start softening butter at the first sign of stress. 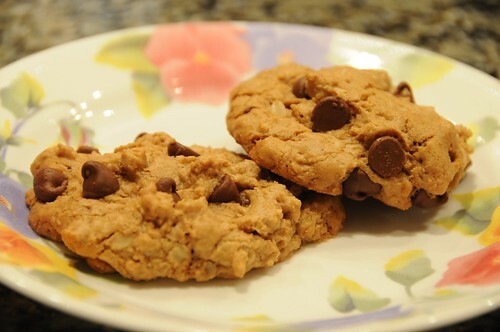 I didn’t enter the realm of oatmeal-with-other-stuff cookies until a few years back. My father has an inordinate affection for a particular oatmeal cookie recipe with no additions, and baking something that looked like his beloved treat but was actually not just seemed cruel. But even he deigned to taste these: chewy and thick, loaded with chocolate, but not too sweet. You didn’t hear this from me, but I bet they’d be good for breakfast. In a big bowl, melt the butter in the microwave. Stir in the brown and granulated sugar, then the vanilla, then the egg plus the yolk. Stir this until it’s all well mixed. Add the flour, baking soda, and salt all at once, and stir to blend. The dough will resemble regular cookie dough at this stage. Then add the oats and chocolate chips. You may have a hard time getting all of the chocolate chips incorporated into the dough, but don’t worry about it. You can always smush them in when you’re forming the cookies! Grease your cookie sheets, and form the dough into little balls about 1 1/2 inches across. Because the dough is stiff, it’s probably easiest to use your hands. 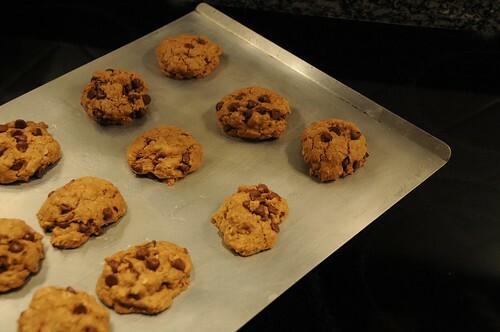 Conveniently, this also allows you to press the chocolate chips into the cookies, which results in more chocolate in the cookies and less burned on to your baking sheet. Everybody wins! Bake for 18 minutes, then start checking. Mine actually took around 24 minutes. These cookies don’t brown much, so you might need to use a spatula to peek at the bottom and see if the cookie has attained cohesion to figure out if they’re done. You can also poke the top with a finger (carefully!) to see if it’s still wet. After removing the cookies from the oven, take the cookies off the sheets — on to wire racks if you have them, or paper towels on plates if you don’t — so the chocolate can’t cement them in place. Try not to burn your tounge. **About oats: people writing recipes seem to think that there’s some vast difference between quick-cooking and old-fashioned rolled oats. In most cases, I don’t find it to be relevant and just use whatever I have on hand. For my batch of cookies, I used about half quick-cooking and half old-fashioned, but don’t get hung up on it.